The ESA has uploaded final commands to the Schiaparelli spacecraft. The Mars spotlight has been focused on NASA and SpaceX for some time now. In the background, though, are other players who also want to reach the red planet. One of the top contenders that hasn’t gotten much attention is the ExoMars Schiaparelli spacecraft. Oh, and it’s landing on Mars next week. The European Space Agency (ESA) uploaded final commands to the Schiaparelli spacecraft, which will land October 19. The commands were sent in two batches. The first one, sent October 3, activated Schiaparelli’s hibernation wake up timers and set the surface science events. The second batch, sent October 7, provided mission command sequences for entry and landing. If all goes well, Schiaparelli will separate from the Trace Gas Orbiter spacecraft October 16. Once it hits Mars’ upper atmosphere, it will reach speeds up to 21,000 km/h (13,000 mph). At around 11 km (7 mi) above the surface, parachutes will deploy, decreasing speed. The only potential concern is weather. Sand particles could start lifting into the atmosphere – which is normal for this Martian season. The ESA doesn’t seem phased, though. In fact, they’re excited. “We always knew we could arrive in a dust storm and Schiaparelli was designed with that possibility in mind,” said ESA project scientist, Jorge Vago. “And from the point of view of getting data on the electrification of dusty atmospheres, it could be very nice,” he told BBC News. Once on Mars, Schiaparelli will have two to four Martian days to conduct tests using the science kits on board. After that, its power will have run out. 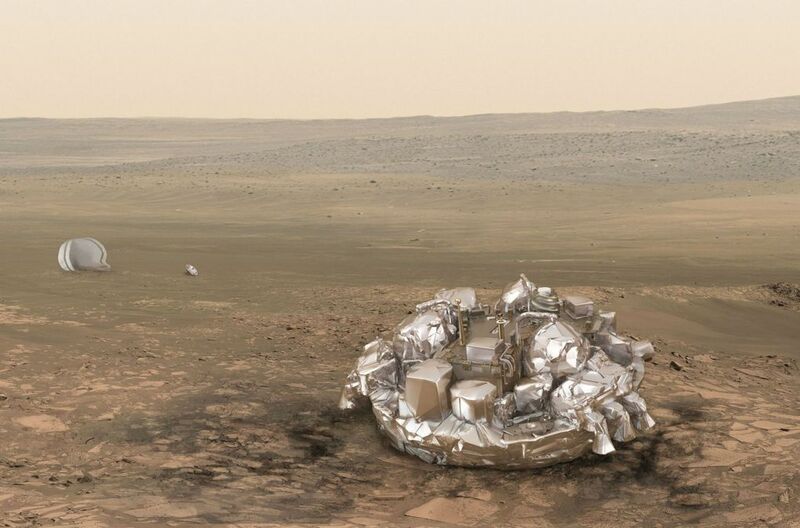 Schiaparelli serves as a test for even bigger Mars missions for the ESA and Russia—in particular the ExoMars rover mission in 2020, which will be able to drill for soil samples and carry out geochemical studies. Want live updates on the descent? ESA’s got you covered. Check out their official Twitter accounts for more information.